SpringBoard is pleased to offer a review of this BCG Skillbuilding lecture, presented 3 May 2018. 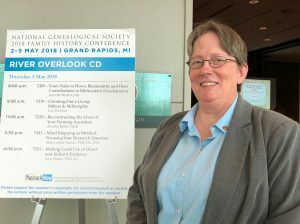 Basing her lecture on Standard 35, Giroux proposes mind mapping as a tool that can help genealogists analyze their sources and the data they contain, develop focused research questions to guide next steps, and develop a logical research plan. Because a mind map is a visual graphic of the ways new ideas radiate from a central idea, mind maps preserve the thinking process we follow to arrive at our conclusions. Mind mapping allows us to see how we arrived at a specific question and why we thought the way we did. For this reason Giroux argues for retaining all mind map drafts to preserve the history of the process and cautions against editing a mind map before making a copy of the earlier version. Recalling the thick day planners some of us intended to carry (but quickly discarded) in the days of shoulder pads, Giroux urges simplicity—at most one document or idea per map—and notes that we won’t use a map if it is too complex. She also advocates using colors or shapes to aid in analyzing patterns and spotting outliers. Through examples of increasing complexity from a short obituary to a 221-page pension file to a complex case study, Giroux demonstrates the three-step, cyclic process she follows by using a different color or shape for each step. She also shares the shape-based work-around she uses when armed with only paper and a lead pencil. 1. Map the basic information. Begin in the middle with the name of the document (red bubble or curly-edged oval). Note each data point in a separate bubble that links to the document (black or rectangles). May add relevant known information, each item in a separate bubble that links to the data point (orange or jagged edges). 2. Analyze each data point by writing the questions it generates, each question in a separate bubble that links to the piece of data (blue or circles). 3. Evaluate questions and note to-do items that could help find the answers, each to-do in a separate bubble that links to the question (yellow or triangles). Combine to-do items in a logical order to make a research plan. All family historians could benefit from adapting all or parts of Giroux’s mind mapping method as an additional analytical tool to help sort, sift, manage, and make sense of the sources they collect and the data held within. 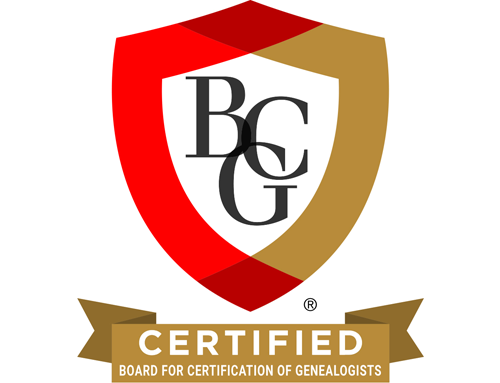 Genealogists who have a tactile learning style will find value in mapping by hand using a tablet of plain paper and a set of colored pens or pencils. Conference planners will enjoy Giroux’s useful Post-it-notes-on-the-wall planning technique. The syllabus maps steps 1 and 2 of a divorce notice, offers four mind map programs, and provides a brief supplemental reading list focusing on evidence analysis. A recording of this lecture may be ordered from Playback Now www.playbackngs.com.